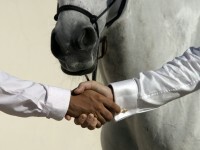 Thanks to our huge, air-conditioned pavilion, HoofbeatZ™ is one of the only equestrian centres in the UAE that can provide equestrian services all year round. Set within a wonderful setting adjacent to the desert and opposite the Dubai Outlet Mall, we are also able to offer our students lessons outdoors during cooler weather. Our pavilion is used for lessons, clinics, workshops and training. It is also fully equipped for our Al Saheel show, with a sophisticated sound and lighting system and tiered seating. Mineral water, toilets and showers are also available on site. HoofbeatZ™ is proud to offer the only riding and polo simulators in the region as well as a mechanical bucking horse that helps riding students to improve their balance and confidence on horseback. These are often used during lessons. We have extensive, air-conditioned stabling and take enormous pride in the level of care and attention that we give to all our horses to ensure they have everything they need for a comfortable and happy existence.